I’ll never forget our Valentine’s Day dinner last year. We had a get together with a few of our couples friends to celebrate our lovey love. We had a great dinner and even played silly newlywed games. Lots of fun, I’ll really miss those guys! 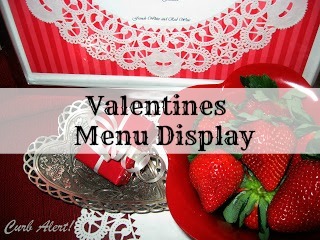 Anyway, I’d like to share with you a little Valentine Menu display idea that I made last year. It was so easy and turned out adorable – here’s a peek. Head over and take a look at this post, Framed Doily Menu to see the details of how I made it. Now off to go raid the fridge, looking at those delicious strawberries are making me hungry for something sweet! I'm looking forward to a full reveal. I just realized you linked up to how to make it, so I went back and read it. 🙂 This is a fabulous idea!